Dep. Sheriff Red Edgman, Dep. Sheriff Dave Harlan, Sheriff Orin Johnston and Henry Troup break up a still near Purcell, Oklahoma in 1933. Oklahomans are considering some of the biggest changes to the state’s liquor laws since the end of prohibition. If approved, State Question 792 would amend the state constitution and alter a system with roots planted during the days of Indian Territory. Oklahoma’s liquor laws can make outsiders do a double-take. Low-point beer. No refrigeration at liquor stores, which are closed on Sundays. Looking for wine at a grocery store? Forget it. It started before statehood. Alcohol was permitted in Oklahoma Territory, to the west, but the federal government banned it in Indian Territory, in what is now the eastern part of the state. Bob Blackburn, the executive director of the Oklahoma Historical Society, says even though liquor was outlawed in Indian Territory, bootleggers and frontiersman would bring it into the area. “Theoretically we were born sober, but we never were. We were always a wet state,” Blackburn said. Things got complicated when Oklahoma and Indian Territories were combined at statehood. One of Congress’ conditions for entry into the Union was a ban on importing alcohol into the former Indian Territories. “They wanted to protect the Indians whose lands had been allotted in severalty, allotted on land that was individually owned. They said you’ve got to keep alcohol out,” Blackburn said. 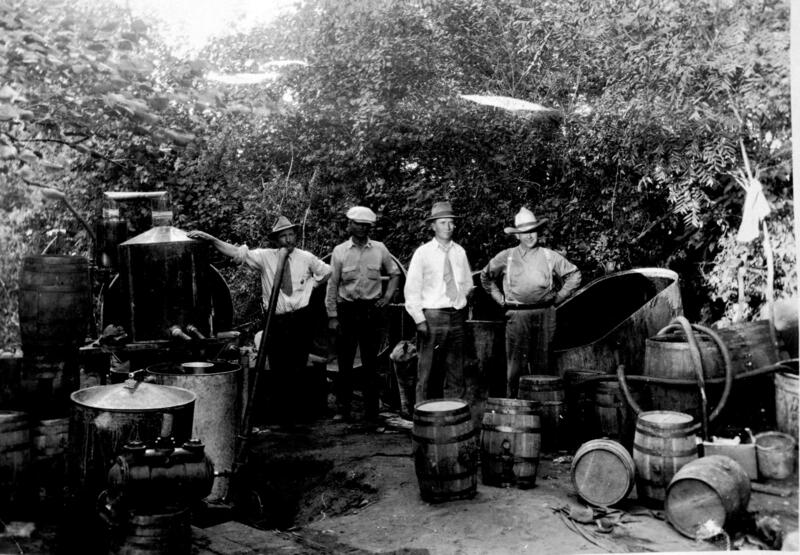 Oklahoma became a state at the height of the Progressive Era, when prohibitionists tried to ban alcohol across the country. Many of the original white settlers in Oklahoma were Southern Baptists and Methodists. They believed alcohol was evil. “So the framers of the constitution say, ‘We’re going to ban alcohol everywhere.’ So when we became a state on November 16, 1907, alcohol suddenly was illegal. Of course it was still here, but it was illegal,” Blackburn said. National prohibition came in 1919, but booze still flowed into the state from Arkansas and Missouri. Farmers figured out corn was worth more as alcohol than as feed. “Those people learned that they could take that corn and instead of feeding it to old Bessie the mule or having it ground for food on the table, why not convert it into something of value. Adding value. Free enterprise. And so you have free enterprise working despite the law,” Blackburn said. Many sheriffs wouldn’t bust the moonshiners because it would be political suicide. Blackburn says some district attorneys would occasionally try to please the church crowd by putting together a so-called “flying squadron” and bust a still. 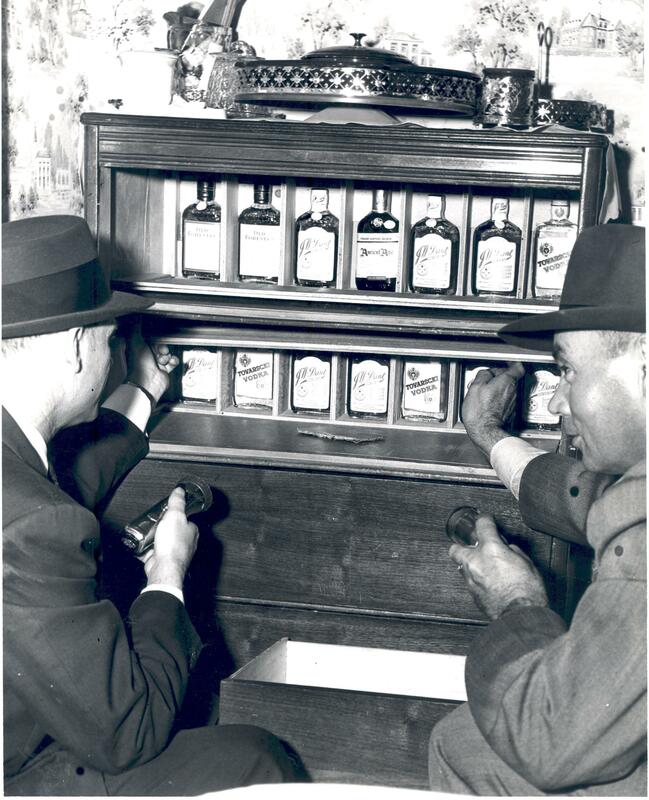 Two men find hidden bottles of liquor. “Of course, the boys down the street, working in the oil patch or working in the packing plants, would be cussing you because suddenly the price of their alcohol doubles because of supply and demand,” Blackburn said. Prohibition ended nationally in 1933, but it continued on in Oklahoma because it had been written into the state constitution. The lone exception was beer that’s 3.2 percent alcohol by weight. 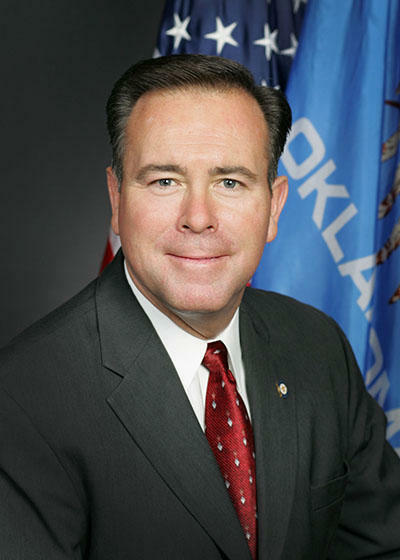 Blackburn says prosperity brought more people to Oklahoma after World War II. The suburbs grew and people were thirsty. They wanted something stronger than low-point beer, and bootleggers and booze runners provided it. Many were protected by local law enforcement. Edmondson argued this underground economy wasn’t being taxed. Blackburn says Oklahomans would have voted against repealing Prohibition because they already had their booze. But Edmondson knew how to get people’s attention. Department of Public Safety commissioner Joe Cannon started to bust all the places that illegally sold alcohol, including the private clubs and hotels. In 1959, Oklahomans finally repealed Prohibition, but it didn’t die without a fight. To appease dry proponents, Edmondson included certain provisions in his plan. Among them, it remained illegal to sell liquor by the drink. Alcohol could only be sold at liquor stores, it couldn’t be refrigerated, and the stores had to close on Sundays. The governor’s office asked a young construction company and dress shop owner named Byron Gambulos to build five sample liquor stores in Oklahoma City to show people what they would look like. Gambulos built one of those shops down the street from the state Capitol to lease out to a tenant. Byron Gambulos at his home in Oklahoma City. This was a rough industry. Gambulos’ prices were lower than his competitors. In November 1964, somebody bombed his liquor store. A second bombing took place the following month. Gambulos says the third bombing caught law enforcement’s attention, and the perpetrators were arrested. His store, Byron’s Liquor Warehouse, is still in business today at NW 23rd Street and Broadway. 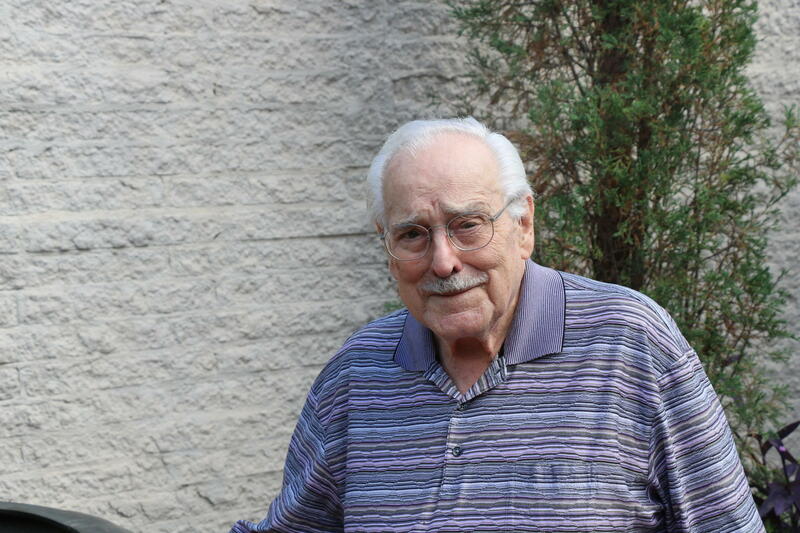 At the age of 90, Gambulos has seen Oklahoma’s liquor laws evolve over his lifetime. He doesn’t like that State Question 792 would change the wholesale system, and he says money would leave Oklahoma. “We were homegrown in the beginning. I wish we could stay that way but we can’t with Walmart moving in. Figure it this way: Their profits are going out of state,” Gambulos said. But other aspects don’t bother him, like selling cold beer and chilled wine. And he says his store will still do well. So he’s ambivalent about the outcome. All his life, he says, he saw things in black and white. This is the first time he’s gray. 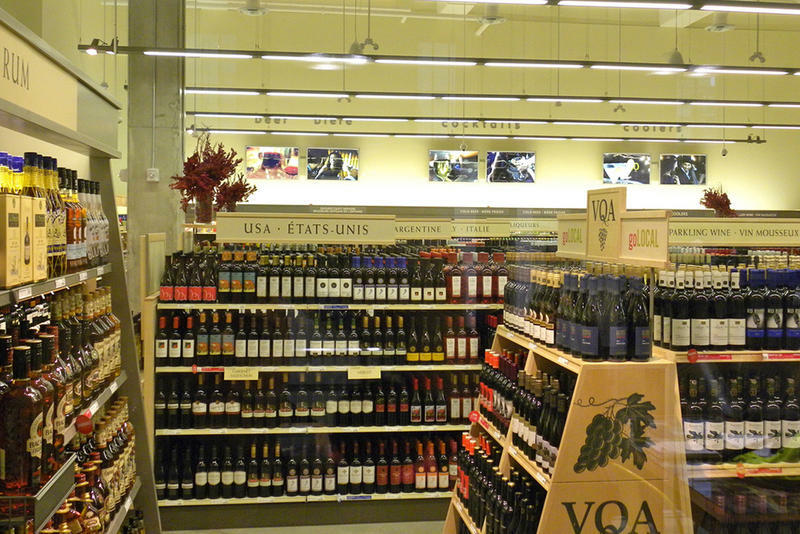 The customer navigated through rows of bottles at Moore Liquor, while Kerr slipped outside. He took a few steps to an adjoining storefront to another business he owns: Party Moore. Oklahoma grocery store groups who are challenging a petition to overhaul the state's alcohol laws say the proposal would provide an unconstitutional advantage to liquor stores. An Oklahoma Supreme Court referee on Tuesday heard arguments from the Oklahoma Grocers Association and the Retail Liquor Association of Oklahoma on a challenge to a proposed ballot measure that would amend the state constitution to allow grocery stores to sell strong beer and wine. A Republican state lawmaker said Thursday that a plan to expand beer and wine sales in Oklahoma would disproportionally affect Native Americans because they are "predisposed to alcoholism." The comment from Rep. Todd Russ of Cordell during a debate over the measure, which passed on a 61-30 vote, drew a sharp rebuke from the chairman of the House Native American Caucus. The resolution calls for a statewide vote on proposed changes to the Oklahoma Constitution needed to allow wine and cold, strong beer sales in grocery and convenience stores. Oklahoma Attorney General Scott Pruitt has cleared craft brewers in the state to sell full-strength beer for consumption on the premises. Pruitt issued the opinion Tuesday after the state's Alcoholic Beverage Laws Enforcement Commission asked him to review a new state law that allows the sale of full-strength beer.